This is a re-post from the Exponent archives. It was originally published on 5th May 2014, and you can see the previous post here. Several months ago I was asked to give a talk in my ward’s Sacrament Meeting in celebration of International Women’s Day. The following is the text of that talk. Sylvia became more and more distracted by their exchange and before I could stop her, she marched over to the two boys. She stared at them intently and then proclaimed, “Now I have the Power.” She snatched at the air in front of their faces as if, in this one single gesture, all of their power and the power of the universe would instantly transfer to her. The look on the boys’ faces was priceless because, at least momentarily, three-year old Sylvie had taken the power. I was shocked–where did this assuredness and sense of entitlement to a theoretical power come from? We tend to be uncomfortable with women claiming power but as far as I can tell there is no doctrinal justification for this, in fact, just to the contrary. So after the shock, I was delighted and so proud that this spirited little girl is my daughter. Sylvia was and is in that beautiful time before the forces of the world try to convince her that she is smaller than she actually is. Right now she has absolute confidence in her place in the world. Since this experience I have often wondered how I can help Sylvie retain this confidence, or at least prolong it. The results of those musings are the genesis for this talk. There is a good deal of sociological research that finds that you cannot be what you do not see. One interesting example: in study of film, generally, there are roughly three male characters for every one speaking, female character. Crowd and group scenes, whether live-action or animated contain only 17 percent female characters. And this ratio of male to female characters has been exactly the same since 1946. What is even more fascinating is that that the percentage of women in leadership positions in many areas of society — Congress, law partners, Fortune 500 board members, military officers, tenured professors and many more — stall out at around 17 percent. Could it be because that’s the ratio that has been represented to us as the norm? How are women to push beyond these current, unequal confines if a truly representative model does not exist? Sylvia’s, as well as my favorite stories all have women in them. This is completely natural, it is human to try and find ourselves in the stories we hear and tell. Unfortunately, even at church, it can be more difficult for women to see our reflection. That is why women’s stories are so powerful–they show all of us things that we may not see otherwise. Several years ago, the church published “Daughters in My Kingdom” which recounted the history of the Relief Society. President Julie Beck said at the time that the stories of our foremothers would give us strength and show us how powerful the women of the church truly are, and I couldn’t agree more. We are powerful, but we have often been painted as less so by people both in and out of the church. The New York Times has recently taken an interest in Mormon women. Indeed, a story about some of our dear sister missionaries was above the fold on the front page of a Sunday edition. As Joanna Brooks wrote, “We were not a footnote. Those are our faces in the photographs. Those are our voices shaping the storyline. In the paper of record in this country, Mormon women were portrayed as the ambitious, intelligent, hard-working, resilient, and dedicated human beings that we are.” Our stories are powerful…And we need more of them! Ursula LeGuin once said “when we women offer our experience as our truth, as human truth, all the maps change. There are new mountains.” I want Sylvia to have different maps than the ones I grew up with. I want her to know that there are powerful women in her own tradition. Women who are smart, faithful, hard-working, kind, who listen to the spirit, receive revelation, and use the gifts of the spirit that they are entitled to as children of God. I will spend the rest of my time telling the stories of four of these Mormon women who have created mountains on the maps we Latter-day Saints have been given. I was a history major at BYU and one of my idols was a historian by the name of Laurel Thatcher Ulrich. For those of you who don’t know that name, Ulrich is a faithful Latter-day Saint and mother of 5 children. She is also professor of history at Harvard and a Pulitzer Prize winning author. Perhaps you have heard the quote, “Well behaved women seldom make history.”? That is Laurel Thatcher Ulrich. Laurel Thatcher Ulrich has provided a model to me of how to balance our love for the gospel with very real concerns for gender equality. Using her own experience, she has encouraged those of us who are blessed with a certain amount of feminist angst to not ignore our concerns but to also polish the prescious truths of the gospel in our hearts. At a time in my life when I didn’t know if I could make it work, knowing her story became a mountain on which I could once again commune with God. Emmeline left Nauvoo to go west with the Saints. When she arrived in Salt Lake, she began furthering the cause of women. She once said, “I believe in women. I desire to do all in my power to help elevate the condition of my people, especially women…to do those things that would advance women in moral and spiritual, as well as educational work and tend to the rolling on of the work of God upon the earth. 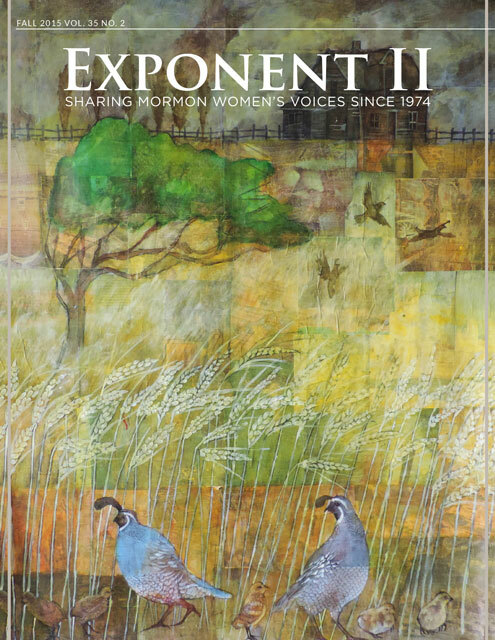 “ Wells founded and edited the Women’s Exponent which was a remarkable publication for its time. She was a famous suffragist, gaining the admiration and respect of national figures such as Susan B. Anthony and Elizabeth Cady Stanton. I remember as a little girl always looking forward to the times when Chieko Okazi would speak in General Conference. She told such wonderful stories. I particularly remember her Cat’s Cradle address where she demonstrated the intricacy and beauty of this pattern. I spent hours trying to replicate the string trick at home. But more importantly, I remembered her call to think about the lasting effect my kindness or lack thereof could have on another person’s life. It was her stories, as a little girl, that influenced the way I treated my peers. To me, Sister Okazaki is a perfect example of the Christ-like attribute of empathy. She had known hardship in her life—having been discriminated against because of her race and then later losing her husband—but she used these experiences to meet people where they were at and to make sure the warmth of the gospel extended far enough to reach them. One more thing I admire about Sister Okazki, her desire to lift the burdens of those around her and her willingness to do the work to do this effectively. Despite having absolutely no training on the subject, Chieko Okazaki gave one of the most profound and important speeches on ‘Healing from Sexual Abuse.’ She talked to hundreds of people, educated herself on the subject, and then found the words to comfort those who had been victimized. This is a difficult subject and one that we don’t like to talk about. But Chieko understood that just because it is difficult doesn’t mean we don’t have a responsibility to mourn with those who mourn and comfort those in need of comfort. Her address is the best treatment on the subject in all of our church’s literature and among the best that I have read in the secular world as well. The last woman I would like to talk about today holds a special place in my heart because she is the great-great-great-great-great grandmother of my children. This woman is Patty Bartlett Sessions and I am honored to have married into her family and borne more of her descendants. Patty Sessions was a deeply spiritual woman who joined the church early and remained faithful until her dying day at the age of 97. She was an incredibly hard worker and steadfast in her knowledge that God loved her. Patty was a successful midwife, delivering almost 4,000 babies with only two “difficult” cases. Tuesday, May 18, 1847. Visited sick in several places, anointing and laying hands on Sister Murray’s son. Nevertheless, Patty had a difficult life. The practice of polygamy, in particular, nearly broke her heart. Her beloved husband, David, took a much younger woman to be his 2nd wife and all but abandoned her. It is a testament to her strength of character that she not only supported herself until the end, but then founded and endowed a school that served the needs of poor and fatherless children. I saw some of these same characteristics—determination, hard work, endurance—in my husband’s recently deceased grandmother and I hope that my children will also possess the same strength of character that their grandmothers did. As long as discrimination and inequities remain so commonplace everywhere in the world, as long as girls and women are valued less, fed less, overworked, underpaid, not schooled, subjected to violence in and outside their homes — the potential of the human family to create a peaceful, prosperous world will not be realized and Zion cannot be. I hope that you see the power of these women, that their stories have touched your lives and have made you resolve to be better sons and daughters of God, better disciples of Jesus Christ. Knowing the stories of women like Patty Sessions, Laurel Ulrich, Emmeline Wells, and Chieko Okazaki will help Sylvia claim and maintain her power and fulfill her potential as a daughter of God. It seems like such a little thing but it matters. I am reminded of the time when Sylvie gave a talk in primary about Mary and Martha. She told me, “Oh Mama, I love this talk! Mary is a girl just like me. I want to be just like Mary!” Sylvie had never expressed an interest or connection to any other scripture story she had heard. And perhaps it was because almost all of those stories are about men. But this story, a story about a woman and a disciple of Christ, captured her imagination. Stories about women matter to little Sylvia, they matter to me, and they should matter to all of us. Help me rewrite the maps for our daughters and our sons. Let us have the power to tell our stories and the grace to listen when they are told.